Nothing is more frustrating as a professional in the hair and beauty industry than someone missing an appointment. Not only does it waste your time, but it upsets the customers who have had their appointment times rescheduled around as a result. Even with a method in place to remind customers of upcoming appointments, effective marketing in a field as competitive as the hair and beauty industry can still be a real struggle. Fortunately, the mobile messaging service that we offer here at Textlocal provides a cost-effective and easy to use solution to direct customer contact, solving the problems detailed above, and many more! Text messaging is the ideal way to drive more business to a salon, targeting new and existing clients with news, updates and offers straight to their mobile phone and making sure no appointments are missed. Send personalised, automatic reminders of upcoming appointments to make sure clients show up for bookings. Target existing customers with updates on products and special offers in the run up to quiet periods to make sure all appointments are full. Attach a price list to a text message through a short link and send to your customer base to make sure your customers are aware of your latest products and are well informed to make their booking. Send one-time use mobile vouchers with unique codes to customers of certain services to offer discounts on other services in your range. Multiple-use mobile vouchers can be scanned every time a client visits with rewards given every few visits. Great for encouraging clients to choose your salon for future treatments. Send mobile surveys via a link in a text message after a client has visited to easily gather feedback about their experience. Use a keyword on a short code to encourage existing and potential customers to text in to receive offers and discounts. Include short links in your text messages to your website so recipients have all the information they need to make their appointment. Are you a mobile hairdresser or beautician? Organise your text message sends from anywhere with the Textlocal mobile app and easily import contact straight from your mobile phone. 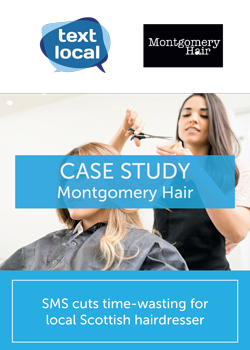 Download our latest hair and beauty case study with Montgomery Hair.